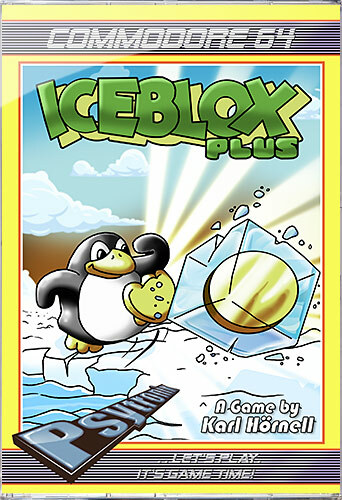 Psytronik Software is proud to present ICEBLOX PLUS, a C64 game by Karl Hörnell, who produced C64 classics like Clean Up Service, Fungus and Velocipede. In this game you control Pixel Pete, the penguin. The aim of the game is to collect gold coins trapped in ice. You can push ice blocks around to snuff out the fire monsters that are roaming around the screens. Once you have collected all the gold coins you will move onto the next more challenging screen. ICEBLOX PLUS will be AVAILABLE SOON from Psytronik Software and will be available to order in standard cassette format, a special clamshell tape edition (limited to 50 copies), budget C64 disk and premium+ C64 disk.